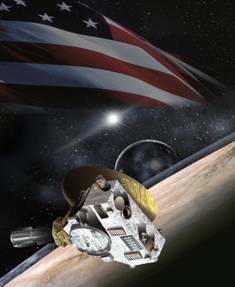 Our space ship, New Horizons, was paid for by the people of the United States of America. New Horizons is on its way to the very frontier of our solar system: Pluto and the Kuiper Belt. Great nations explore. Echoing the words of Dave Scott as he stepped onto the moon as commander of Apollo 15, "This is exploration at its greatest!" With the rush of events surrounding launch over, I am back to writing this column about once per month. We're more than 100 days into flight now, and in every respect, New Horizons continues doing fine. As you know, the New Horizons mission team spent the first couple of months checking out the spacecraft subsystems and making our initial post-launch trajectory correction maneuvers. All of that went exceedingly well: We have a very healthy spacecraft flying right on its intended course to the Pluto aim point it must reach at Jupiter on February 28, 2007. April included our crossing the orbit of Mars, outbound at over 75,000 kilometers an hour (47,000 miles/hour), on April 7. That was a nice milestone, but the biggest spacecraft event of the month was a new software load for our Command and Data Handling (C&DH) system. This load, called C&DH 3.5, went up and on line a few days before we crossed the orbit of Mars — on April 5. C&DH 3.5 contained a fix for a bug that we wanted to protect against well before we update the code in a more extensive way after the summer. That code version, called C&DH 4.0, will include a variety of capability enhancements, including data-compression capabilities we'll need for downlinking Pluto data. I'll have more to say about the C&DH 4.0 load in a few months. For now, I just want to say that the 3.5 load is up and running as expected. To invoke a new C&DH load after it is transmitted up to the bird, one has to reboot the main spacecraft computer. So you can imagine how much care, how many design reviews, how much event simulation, and how much nail biting was involved in planning for this. Of course, the Applied Physics Laboratory (APL) spacecraft and mission ops teams made it look easy on April 5, which is a real sign of the careful advance work put in over several weeks leading to that big day. With the spacecraft doing well, most of the activities of April centered on instrument checkouts. Ralph, our main remote-sensing suite, and REX, our radio science experiment, both performed flawlessly in their initial functional checks. These occurred on March 21 and April 19, respectively. Additionally, the SWAP solar wind detector, which opened its launch door on March 13 (the 151st anniversary of Percival Lowell's birthday, no less! ), turned on its detectors on March 28 for the first time. All went well. Meanwhile, the LORRI imaging team has been collecting pre-door-opening calibration images to characterize their detector noise in flight. They are seeing some additional, nuisance-level noise events over what was seen on the ground. This is common when you get your instrument into the space environment, and something we expected since our spacecraft is carrying an RTG that was installed after the instrument calibrations. In fact, we expect the Ralph and Alice detectors to see the same kind of elevated, but still nuisance-level, noise when they calibrate in May. Speaking of May, both PEPSSI (on May 3) and Alice (on May 20) will soon open their detector doors. Carefully, step by step, both of these instruments will then be fully powered and have their detectors turned on for "first light" measurements shortly thereafter. Next up: Ralph's front door will open on May 29. But since Ralph's door has a see-through window, first light and some early calibrations will be made on May 10. These will each be big milestones: we are opening up our "eyes" to space! Yet another milestone will be our first "AU crossing," which will occur on May 7 when our spacecraft crosses 2 Astronomical Units and is twice as far from the Sun as the Earth. We'll have 31 more AU to go to reach Pluto, but just 3.2 AU to go to reach Jupiter.